Today I spent a lot of time working on the ailerons. I know I will need to remove them again a few times, but I wanted to get it figured out how many washers and how much spacing etc, to make them as centered as possible. I got them centered, and then alligned with a version of a fixutre that Vans recommends. I basically took two straight 1 by 2's and used a few 3 inch #10 metal bolts in the tooling holes to align for the center of the cord of the wing. 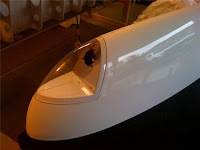 Note that the directions have you use the two tooling holes in the main rib, and disregard the tooling holes in the aileron, just use the trailing edge point to determine center cord. Worked fairly well, so now I am on to the next step of alligning and drilling the flaps. Left Wing is now structurally complete. I riveted it in the stand just like the right wing. Then all at once the whole garage changed for the better.. It had looked almost the same for 9 months with the wings on the stand.. Then after the left bottom skin was complete, Bekah and I started pulling the wings off the stand and putting them in the cradle. It was an exiting day.. This weekend Bekah pitched in another hour and we finished riveting the right bottom skin. At this point the right wing is structurally complete ! I will leave it in the stand while the left wing gets buttoned up, then they both will go into the cradle sometime this week or weekend. Also, a side note I had some fellow RV builders from Belgium stop by. Connections through where I work tied us together as they were visiting the US on both vacation and an RV research trip. They have recently started building an RV-7 quick build. It was good to compare stories and talk about RV building practices. Building RV's brings people together from all over the world literally..
With The Tech Council visit now behind me, I have started the final riveting session on the right wing. The outboard bottom skin is now in place and getting riveted. Going well so far, I have found that working with the wing in the original stand has been quite simple. I am really excited about getting the wings in the cradle, but to me it seems best to just keep moving on them and rivet while the riveting is good. Vans recommends doing bottom skins with the wing on a table, but with Rebekah helping me on some of the more difficult spots, we have been able to get through it pretty easily. Those access holes really help as I can get my arm in there and really work that bucking bar. The times when we need to peel the skin back are a bit tricky, but no more trick than if it were laying on the table and the skin is vertical vs. horizontal which makes more sense to me. Today I was lucky enough to have Joe, the local EAA Technical Counselor come by to look at my wings before I close up the bottom skins. Overall I passed the examination, although he did point out a couple rivets I could "tighten" up a bit. It's great to be able to have independent feedback along the way to ensure you are looking at things correctly. In this case I pointed out all the areas that I was curious about and Joe indicated all looked good and there should be no problems. Mostly though the conversation was around good techniques and he pointed out some of the pitfalls that I can avoid in my next steps. In case you were interested in what a technical council visit is and why I had one, here is my attempt to explain. The FAA does not officially require any inspections during the build phase of an Experimental Aircraft, only a final inspection is requried to be certified for flight. This can be good and bad I think mainly depending on the builder. Some countries like Canada do require inspections at specified points along the way. In the US, the EAA offers volunteer counselors that you can optionally contact throughout your build who can provide the same type of review. Most builders do it since it is far better to catch problems early in the process than during the final FAA inspection. Joe gave me an EAA technical council document that I will maintain with my records. These documents can be used to show the FAA DAR that everything was looking good throughout the build. It also shows proof of build stages and that you were conscientious along the way. 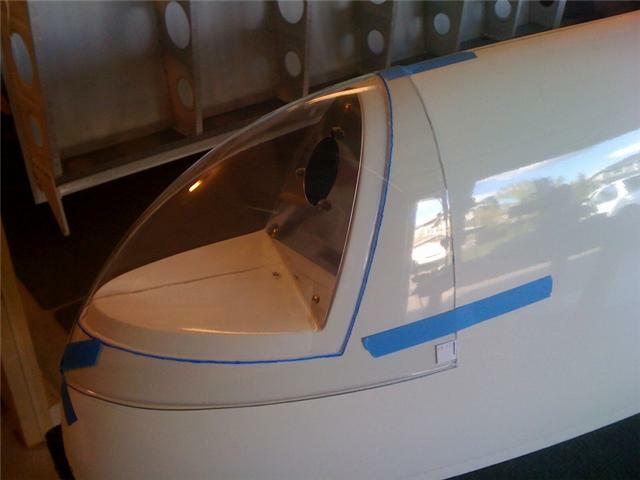 4) after the forward firewall is mostly complete just prior to the final FAA DAR inspection. Basically Joe said that anytime you feel you want to get a second opinion and have enough progress to justify a reveiw you can call your local counselor. I am pretty sure I will be seeing Joe about once a year as I hit these milestones. But for today we are complete and I am ready to move onto the next steps in my build. 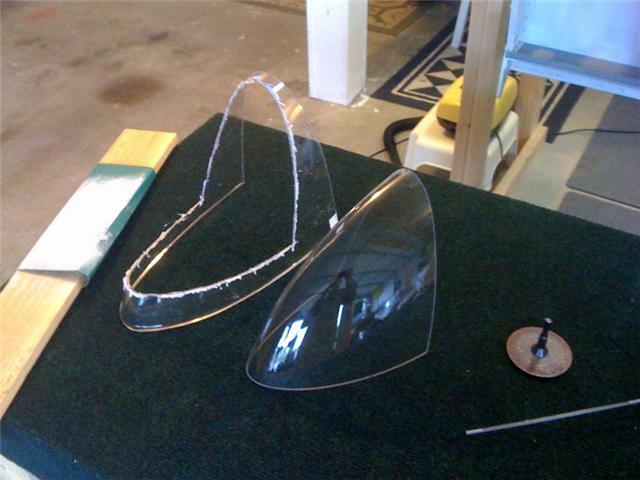 Today I worked on the left wing tip lens so now both tips are "mostly" complete. This one turned out pretty good also, but I did get a small scratch on the bottom of the lens, nobody will ever notice unless they read my blog and then comment. ;-) For securing the tip lenses, I have decided to Tap the Nutplates that hold the lens (so that the screws only have slight friction), then I will use flox and epoxy to mount the nutplate, vs. the rivets that Van's recommends. I can't seem to get a squeezer onto the rivets and don't want to use a rivet gun on the fiberglass. Something I am saving for a later date is the mounting of the LED Nav/Strobes and final finishing inside the lens. I also primed both bottom outboard skins. Once my tech inspection is complete (tomorrow) I am ready to finish riveting those skins and be materially complete with the wings. Since I am waiting for a tech council visit, and the fuseloge has been delayed, I am now turning my focus to the wing tip lens. Some people spend hours on these and I am finding that it has taken me a few myself. First you cut the single provided piece of plexi into two halves, one for each wing. Then trace the outline of the cut out on the plexi, and cut with die grinder tool. Then you start sanding and keep sanding, trying not to scratch it or mess it up in any way. I am zeroing in on the right tip per the pics, but not completely finished. The only valid reason I can think of for taking a week long building break.. Super vacation to El Caribe !